Hi everybody, my name is Patricio and I have been involved with Amigos de Jesús for the last seven years, so imagine that for me, to choose one lesson of being part of this beautiful family is not easy because I have so many. But I want to choose this gift of being thankful and I have learned this from the children especially, especially in my prayer life. And another thing that I want to share with you all is that in living with the children, they have taught me to grow in my faith in Jesus and in my life in him, especially in the service to the smallest of us, the poor, the criminalized, and the discarded. So thank you very much Amigos de Jesús and thank you Lord. Happy Anniversary! As I said in the video, the children of Amigos de Jesús have taught me to be more grateful and open to changes. God always finds the right way to help us in on our paths that many times is incomprehensible but with the grace of God the result is always beautiful, full of wonder and surprises. Twenty years ago, a Honduran nun, Sister Teresita, a lay couple, Christine and Anthony Granese, and Father Dennis O’Donnell were founding Amigos de Jesús in Honduras and in that exact same year, I was experiencing a strong and deep calling to the priesthood in Buenos Aires, Argentina. Same year, different countries, someone would say “coincidences of God." 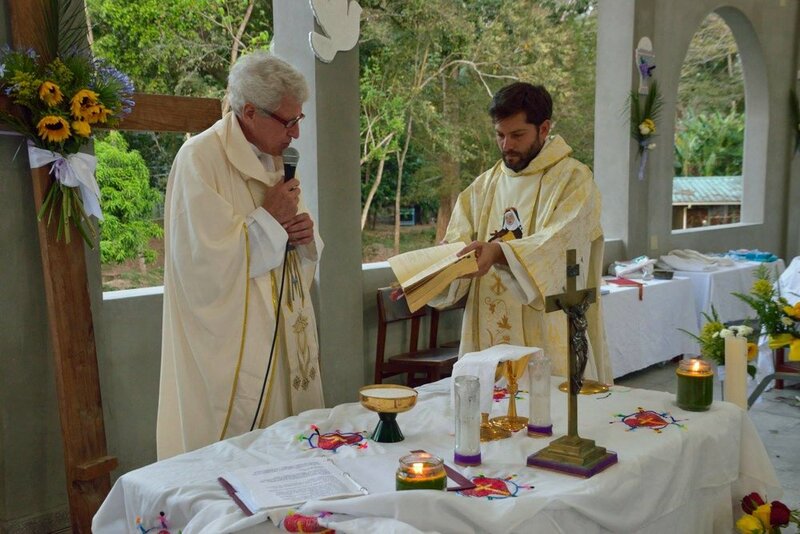 There was no way for me at that time to think about becoming a priest dedicated to an organization located in the U.S. with its main ministry in Honduras and with new doors of missions being opened by the Lord worldwide. I was going to be a priest in a small parish in the suburbs of Buenos Aires; that was my plan and what I thought was God’s calling for me, too. But as I said before, there are many wonders and surprises waiting for us, and here I am now, a priest for Amigos de Jesús, being part of this awesome family. Anyway, many years after my calling (1997), I met a former Amigos volunteer who introduced me to Father Dennis. From him, I received the invitation to travel to Honduras and had the chance to meet the children. That first trip made such a huge impact in my life to the point that I decided to go back every year “to help the children” when (being honest) the one who was being helped was me. In this “piece of heaven," as I like to call our family, I can see the hand of God that “writes straight with crooked lines." In the children's sufferings, in my sufferings, God in his/her tender love has the power to rebuild what it is in ruins and give new and unexpected horizons of healing, love and hope. I see that all the time in our children and I could experience the same in my life. What I have been learning is that God has given a particular spirituality to Amigos. When you visit our home, you can experience a unique gift of the Spirit that is found there. Twenty years ago God poured out in Fr. Den, Anthony and Chris, and Sister Teresita a foundational grace, a small seed that wanted to grow and now has become a big tree where many children can rest and find hope (Matthew 13:31–32). Twenty years later, we are called to allow God to unfold all the potential that this seed has in it. I am learning about the spirituality of the “least and the last” (Matthew 20:16) (Matthew 25,40). I am learning to become a disciple of Jesus in the children. I am learning that the Kingdom belongs to those who are like the children. I am learning that less is more. I am learning that by following the cross, I will find hope. I am learning that nothing and nobody is completely lost, that there is always hope. I am learning to have an optimistic view founded in our Christian faith. I am learning that you can love again, even after horrible pains and hurts from the past. I am learning that just love has the power to heal and save. I am learning that despite our bad decisions, there are always new opportunities. I am learning that in our Christian life, the best is always to come. I am learning to be more grateful in my prayer life. I am learning to pray in silence and contemplate the Lords presence in everything and everybody. I am learning from the children to have a life of service. I am learning from a spirituality of the feast. Our God is a God of wonder. What does God want to do with this small seed? What branches are growing between us? What treasures are still hidden in the “family of the least and last?” I want to keep discovering new lessons and surprises. Here we are Lord, take us wherever you want. Do you feel the calling to be part of this movement and flow of grace? You are welcome!